Joseph Park, whose recent work is featured in this solo exhibition (through August 20, 2011), “This is Prizmism,” is an outstanding painter. It is apparent as soon as you enter the gallery, which is divided into three specific sections: one representing the “school” of prizmism (works done in a variety of explorations using the style); another, the full realization of the style; the third, the “masterpiece”—we are witness to the steady progression of a genre. This is a style that the artist has developed and, as the name implies, subjects look as if they’re being seen, at least partially, through a prism: angular and often featuring a riot of dazzling color. Fittingly, the school section features figure studies, plaster casts of heads, and the equipment the artist uses to practice his craft, namely, an easel that can hold the artwork at any angle or orientation and at a variety of heights. In the next room are eight medium-sized works of various subjects: a portrait of Van Gogh, a self-portrait, two home interiors, a pair of abstract works—demonstrating a full range or realization of the application of prizmism. 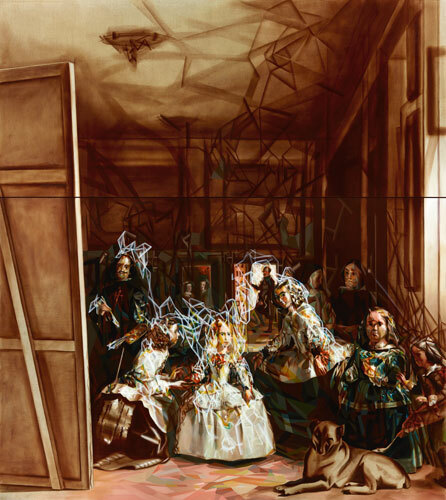 The final room has only one work: “Wizard,” a large (81 x 72 inches) prizmism-ed take on Diego Velásquez’ “Las Meninas;” a nice art historical nod not unlike those we find in the work of Vik Muniz. The show’s concept hovers on gimmickry. As other critics have noted, the work tends to be overly rich and somewhat show off–ish. But this can be forgiven: Showing off is only unforgivable if you can’t deliver. And Park delivers. He inspires us to want to look with care at each and every painting; to realize which works alone make his case. If he adds on beyond that, the rest serves to demonstrate that Park is a master of his vision. Jacob Aue Sobol, "Untitled #8," from the series "Sabine," 1999-2002; gelatin silver print. Courtesy the artist and Yossi Milo Gallery, New York; © Jacob Aue Sobol, courtesy Yossi Milo Gallery, New York. Five spacious rooms, each featuring a series of works by a different artist—Jim Goldberg, Daniel Schwartz, Zanele Muholi, Jacob Aue Sobol, Richard Misrach—comprise this wide-ranging, direct, and personal photography exhibition. Like the book project from which the exhibition takes its name, published in 1929 by German photographer August Sander, this show aims to capture our contemporary moment in time by looking at the “faces” (mostly the photographs feature people, save Mirach’s series, which features graffiti in post-Katrina New Orleans) of specific situations around the world. The show opens with poignant as well as beautiful images from San Francisco–based Goldberg’s series “Open See.” The series comes out of a project documenting new European immigrants and focuses on the African countries they come from. The people photographed, all of whom are desperately poor, are often facing the camera and shown within the context of their surroundings, be that a small hut or standing atop a pile of rubble. Throughout, they exhibit an undeniable strength—which, we assume, can only be known by those who have survived deplorable situations. In the next room are thoughtful, meditative works from Schwartz’ series “Traveling Through the Eye of History.” From 1995 to 2007, the artist captured images along the historic Silk Route, which travels through parts of central Asia, Afghanistan, Iran, Kashmir, western China, and Mongolia. Especially as regards areas that have been heavily affected by war (particularly Afghanistan), these are refreshing for their everyday look. And while we see signs that conflict has taken place—most notably the large empty space in an Afghan hillside where a giant Buddha (destroyed by the Taliban) once resided—the images aren’t about the drama of particular moments in history. This is what you see, what you experience, just being in this place; these are people going about their daily business. South African photographer Zanele Muholi presents straight-ahead, formal, background-less, black-and-white portraits of transgendered and homosexual South Africans, people who are often targets of violence, discrimination and ridicule. We are informed that even the most violent acts against these people go unpunished because there are no laws regarding hate crimes in South Africa; some of those photographed have died as a result of this violence. The works are undeniably powerful; the strong, direct, “everyday” people—none of them stand out visually in any obvious ways—who serve at Muholi’s subjects put a face on a horrible circumstance. 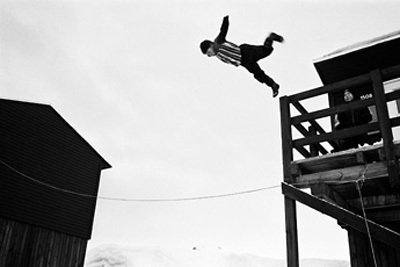 Aue Sobol presents candid shots from the life of his girlfriend in her hometown of Tiniteqilaaq, a small fishing village in east Greenland. The work is intimate and has an atmospheric quality. The haziness, off-kilter angles, and personal moments captured balance the rest of the exhibition, which elsewhere is more formally polished. The exhibition ends on a sad but somewhat humorous note, with Misrach’s post-Katrina images of graffiti messages on New Orleans homes that were devastated by the floods. These works feature not one person (or any other living being, for that matter), but are nevertheless alive with raw human emotion: sarcasm, disappointment, sorrow, and anger. This is what happens when you have nothing more to lose. From the undeniably funny “wicked witch” painted on the side of a house, with an arrow pointing down to the ground, to the defensive and confrontational “I am here; I have a gun” painted on boarded up windows, Misrach deftly, elegantly conveys the wide range of reactions elicited by those who suffered the worst of the storm. These artists put a human face, one we can identify with, on situations a great many of us have no personal experience with. They bring far-away situations into our direct contact, without drama or fanfare. These instances are as remarkable as they are ordinary. The power of the exhibition, then, lies in the ability of these works to touch on intense, loaded, or very personal subjects and remain fascinating to fully digest. These works don’t punch or shock; they gently, beautifully present our reality, and are an opportunity to take it all in. This exhibition continues through October 16, 2011. 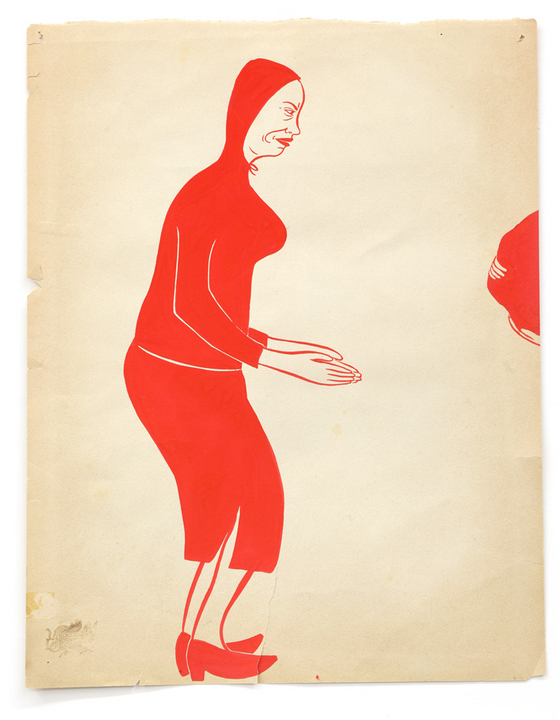 “Summer / Selections” (through August 5, 2011) is an excellent opportunity to view a healthy sampling of over 40 pieces, some of which have never been shown, by the late Margaret Kilgallen (she was only 33 when she died, in 2001). Kilgallen was a seminal member of what has been dubbed the Mission School, the graphic, folk-art-esque, street-art-inspired SF movement of the early 1990s that produced other such notables as Chris Johanson and Barry McGee (Kilgallen’s widower; the shared visual language between McGee and Kilgallen is evident in both artists’ work). Kilgallen’s art is deeply rooted in craft, in particular that of sign-painting. Further lending a hand-hewn feel is her use of roughly sewn-together canvases and repurposing of paper. But what is most captivating about Kilgallen’s work is her use of line, shape, and color, and the attention cast on everyday subjects and objects: trees, leaves, faces, shoes, and even simple repeated patterns. With minimal crisp, smooth edges used to delineate her graphic, highly stylized depictions filled in with only one or maybe two flat colors, Kilgallen operates with maximum efficiency to maximum effect. The commonplace is elevated to a level of rich meaning; Kilgallen speaks in elegant visual haikus.